Some people say we are bold (or crazy) to sail across oceans. However, coastal sailing is a different challenge. There are strong currents and tides to consider, weather from the wrong direction, deadlines to reach anchorages before nightfall, and most of all – land to avoid! After sailing over 3,500nm from the warm Caribbean to the chilly south coast of Ireland we knew that we would have to pull out all our tricks to successfully sail the rough west coast of Ireland. This exposed and rugged coast is regularly smashed by the cold ocean and the coastal drive is known as Ireland’s ‘Wild Atlantic Way”. After nine nights at sea, we arrived in the wee hours of Monday 10th at Baltimore at the southern end of Ireland in County Cork. As it was still night we couldn’t see the Fastnet Rock, except for the light from the lighthouse. 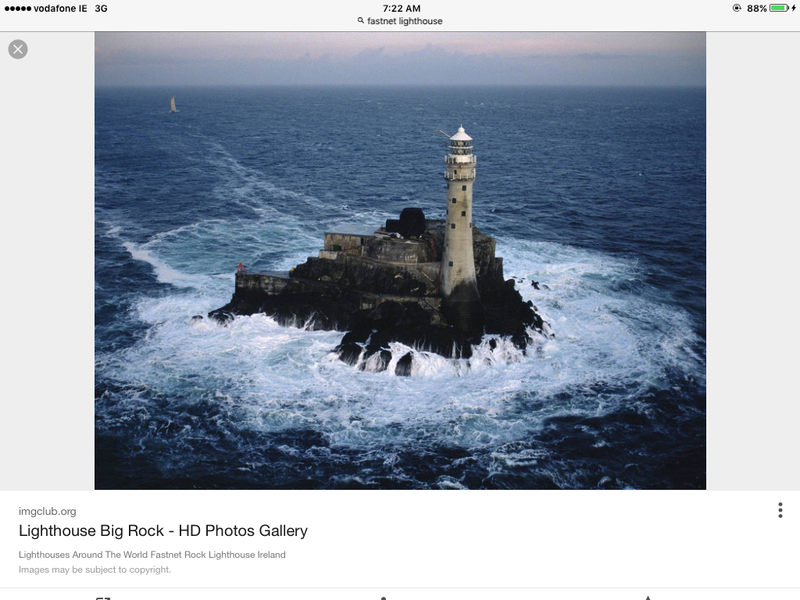 Also known as the “tear-drop of Ireland”, the Fastnet Rock was so-named as this was the last thing impoverished Irish in the 1800s would see this on their way to a better life across the Atlantic. During our few days at Baltimore a variety of weather from cold to warm, overcast to blue sky, plus a couple of days of stiff north-westerly winds kept us either holed up from the rain or enjoying a sunny walk along the bay greeting cows along the way. Baltimore’s harbour master is friendly and after we interrupted his morning tea of scones and jam, he gave us the run-down on the village. He can also arrange for Customs to clear us in. There is no laundry in town (service in Skibbereen) but there are showers at the back of the harbour masters building. A small supermarket is in the village for essential items. Before we left Baltimore we fuelled up from a truck at the dock, arranged through the village supermarket. 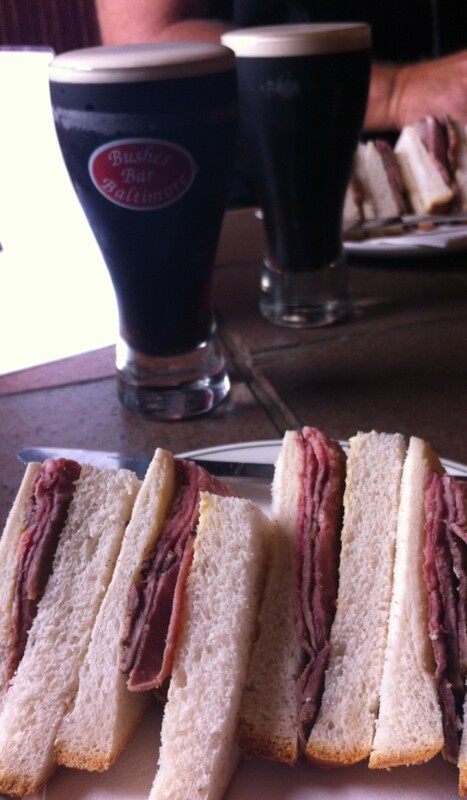 There are a few pubs in the village – Bushes Bar was the first place we stopped in Ireland for a pint of Guinness and a roast beef and hot mustard sandwich. Waterfront restaurants serve huge pizzas and fish and chips, and on a sunny day the place is packed with tourists. A walk to the Baltimore Beacon aka “Lot’s Wife” takes around 20 minutes and offers stunning views of the craggy and ocean smashed coastline and the open entrance to the bay across to Sherkin Island. Baltimore harbour has an active sailing/rowing community. As we’d arrived during school holidays the village was filled with energetic young people waiting for their turn to sail their dinghies or row their boats. Each day we would hear a ‘thump’ against the hull only to find one of them had tacked directly into us sometimes snagging their tiny mast to our shrouds! Coruisk arrived at Baltimore the same day as we did, so over the subsequent days so both crews enjoyed a few meals, a few pints and a day trip to Skibbereen to celebrate Emma’s birthday. Bus Éireann, Ireland’s popular bus network, has buses to Skibbereen throughout the day; the stop is just outside the harbour-master’s office. From Skibbereen there are buses to Cork and beyond. Skibbereen is famous for the wrong reasons. During the famine in the mid 1800s, thousands of poor souls perished in this southern town. But nowadays, Skibbereen has plenty of food to offer passing tourists with many restaurants and bars and pokey shops to browse through. Most importantly there’s a Vodaphone store to buy your pay-as-you-go internet SIM cards! From top to bottom, Ireland is merely 260nm in length. But with all the bays, islands and peninsulas to explore, the coastline is over 1500nm (around 3000kms). It was time to go exploring! North Atlantic weather rolls in fast so it pays to be aware of the forecasts. The Irish Coast Guard reports regularly on VHF referring to wind speed using the Beaufort Scale, which is not generally used in Australia. Usually only one day’s forecast is announced probably because the weather can rapidly change. Tides in this part of the world are a relatively small 2-3m and again we are reminded to keep vigilant. Sailing here is similar to sailing on the west coast of Tasmania, but it is less remote that Tassie. We still rely on our weather grib files for this region. Another good source of information is the Reeds Nautical Almanac which we bought online before arriving here. From Baltimore we motored through the northern channel known as The Sound, using the ebb tide to flush us out into Long Island Bay. Leaving Crookhaven to north we rounded the most south-westerly point of Ireland with great views of the suspension bridge at Mizen head. Six hours and 33nm later we entered from the east the northern side of Bear Island where we picked up a free visitors mooring (one of two available), just outside the channel markers at Lawrence Cove. The Lawrence Cove Marina is tiny, but there were big yachts like ours too so it must be deep enough. A short walk into the village of Rerrin we found O’Sullivan’s pub where we had a pint of Murphy’s and watched the locals as they watched Gaelic Football on the telly. It was just like watching an Aussie Rules game back home! Back on board we loaded the dinghy on deck and settled in for the night. We departed Bear Island through the narrow western entrance on the ebb tide with a couple of local fishing vessels taking the lead. 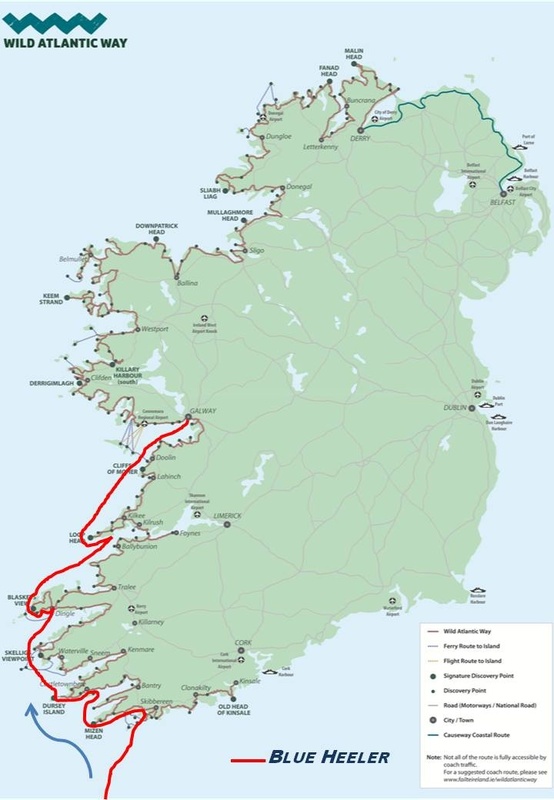 As the weather was mild and calm, Wayne thought it was a good idea to motor through the Dursey Sound, between Crow Head and Dursey Island (the most south-westerly island in Ireland). Across the Dursey Sound a cable car 21m above shuttles punters across to Dursey Island. Our mast is around 18m so our mast had plenty of leeway. We arrived at slack tide with hardly any wind and a light swell. Despite all this, the incoming swell still made me nervous as it crashed on the rocks to each side of us. Situated between Dursey Island to the south and Valentia Island to the north are the famous Skellig Islands. Famous due to the monastery perched on the top of Great Skellig. Built hundreds of years ago, this is a popular visit for tourists, but we were happy enough to sail by this day as we can’t anchor there. Eight hours, 45nm, a dozen dolphins and plenty of puffins later, after rounding Valentia Island, we arrived at Valentia Harbour at Knightstown. Apparently whoever had planned to build the marina ran out of money sometime after the GFC. So it’s a cheap place to stop with plenty of free dockage inside or outside. Depths are fine and we had no trouble docked on the western side of the inner harbour. The small village here is known as Knightstown and a regular ferry service runs across to the mainland or across to the Skellig Islands and across to the mainland. There is a small shop, a cafe, and other touristy places to see and the Royal Valentia Hotel has pints of Guinness and good food for tourists. We could have stayed longer here and caught the ferry across to the mainland and a bus to Cahersiveen, however a strong blow was expected soon and we decided to head to Dingle Marina to ride it out. I don’t think this harbour would be ideal in a strong NW blow. From the harbour at Knightstown we had a good 15nm sail across Dingle Bay to the dredged channel into the Dingle Marina. I’d phoned ahead to book a berth and we were welcomed by marina manager Peter who took our lines and gave us the run-down on facilities. Recommended to us by at least two locals is the small restaurant Anchor Down. Not far from the marina, this cosy restaurant serves delicious fresh fish meals. Back at the marina, we took the opportunity to clean up and replenish, since we hadn’t had the opportunity since leaving the Azores. There are showers (token), a nearby Supervalue supermarket to stock up with fresh meat (and yummy cakes! ), and a laundry service nearby the Texaco (near to Supervalue). As expected, the weather turned nasty, blowing 40kn into the marina (and apparently up to 50kn outside – brrr). With our Webasto heater on inside it wasn’t long before condensation dripped from each window. As soon as the weather cleared we left the marina and motored the short 6nm distance to Ventry Harbour where we grabbed a free yellow visitor mooring. The moorings don’t always have lines attached so it’s always a little tricky to grab the metal shackle with the boat-hook and thread it. Wayne managed to reach down from amidships and hook a line. Leaving Ventry Harbour we motored west passing through the swirling currents of the Blasket Sound. The best time to run this course is at slack tide. But we didn’t want to miss out on seeing the hundreds of seals on the beach of Great Blasket Island and the hillside ruins, so we detoured for a view before heading north towards Sybil Point. From here we sailed north-east using the most of the flood tide to cross the Ballybunnion Bank and enter the Shannon River estuary to the anchorage at Carrigaholt, 52nm from Dingle Marina. Initially we grabbed what appeared to be the only tourist mooring, but after re-checking the tides in the area (5m) we realised we wouldn’t have enough depth at midnight on the mooring. So we dropped the lines and anchored in deeper water on a sandy bottom. 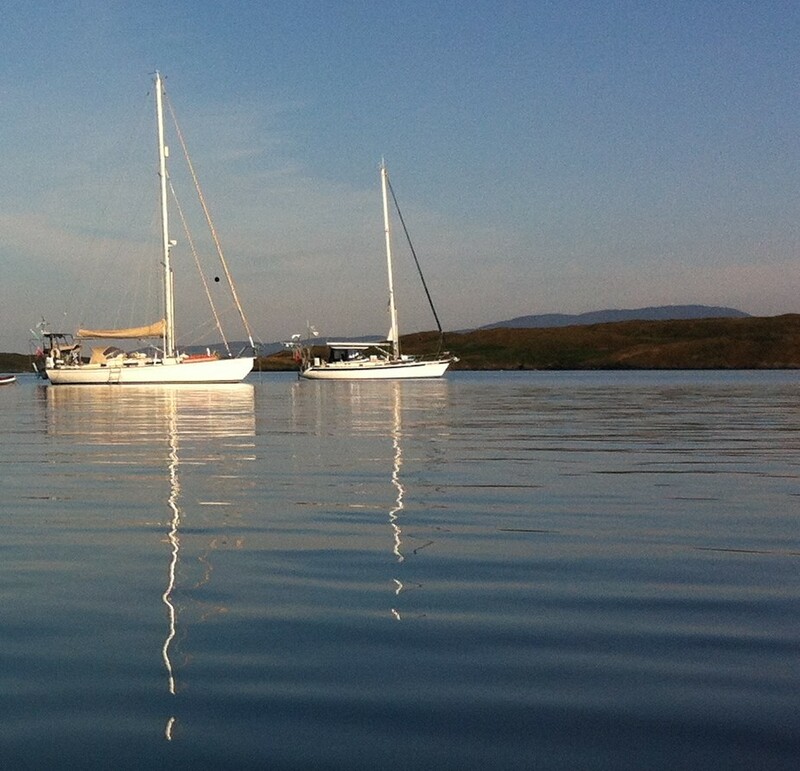 After a calm night, we left very early the following crisp morning and motored 10nm around Loop Head then had a wonderful sail passing through the south sound between Doolin Point and Inisheer in the Aran Islands. Along this stretch of coast are The Burren and the famous Cliffs of Moher, a UNESCO Geopark with the Aran Islands to the west. Rising to around 200m above sea level, these imposing cliffs offer stunning views from aboard. Speckled on the ridge of the cliffs are hundreds of people all looking down on our tiny vessel. The Burren is a 1500ha slab of limestone famous for its bleakness and despite its lack of topsoil, its flora. To ensure we caught the flood tide and reach the Galway Harbour tidal lock at top of the high tide we motor sailed the final 20nm, arriving at 5pm. There are visitors moorings outside of Mutton Island if your timing is out. Galway Harbour isn’t fancy although with planning permission yet to be granted, Galway should have a magnificent new waterfront and marina in the coming years. There is a tidal lock which opens two hours before high tide then closes at high tide. This means there is only two chances to escape each day. We entered at 5pm with still an hour or so of flood tide. There are floating finger docks and we managed to find a vacant one. Despite each berth having plaques indicating each has a berth owner, the marina office told us to take whatever was available, so we did. The Marina has no facilities, not even a toilet block. But they do have a pump-out station and the nearby Harbour Hotel offers showers for €5. Ten minutes walk away is a self-service washing machine and dryer, located outside and next to the Texaco, opposite the cemetery. And so, the cooler climate has taken its first casualty. After five years our starter battery called it quits. In Galway, Battery World has what we need so we have a new one on its way. Fortunately our visit coincides with the Galway International Arts Festival. Around town are plenty of buskers, fire-eaters, painters, and sculptors each with a cap out for a coin or two. Those million tourists from Dingle are also here and they’ve each brought a friend! This place is packed with tourists! Once more the crowds were too much for our simple life (why does everyone walk so fast? ), so we ducked into the nearest pub we could find (didn’t take long) to enjoy a quiet brew and listen to the beat of a bodhrán teamed with the melody of an Irish flute. Sláinte a chara! 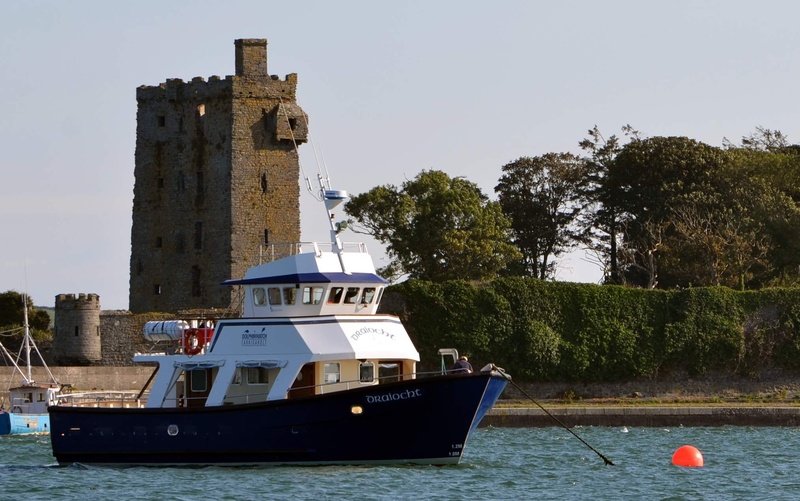 Once again the weather will turn sour along this Wild Atlantic Coast, so rather than beat into big seas and battle strong winds, we’ll keep the boat at Galway while we hire a car and have a look at Ireland from the inside. Aside | This entry was posted in 2017, Ireland, North Atlantic and tagged Atlantic, Dingle, Galway, Ireland. Bookmark the permalink. I have told so many people here in Columbus Ms. about you. I atmire You and have enjoyed reading what you have shared about your travel. Be safe.